CBX RNS510 & Accessories: When to Change Spark Plugs ? When to Change Spark Plugs ? Sent my Passat in for her 60,000 km service more than a year ago at Leng Kee Volkswagen. The bill came up to be over $650 and I would have expected that a new set of spark plugs to be replaced. Or was it ? Now at about 92,000 km , suddenly I experienced a sudden random misfire issue when I was driving it out of the car park for a trip. The EPC light appeared and the engine struggled to move the car back to the carpark. Had to drive in manual to keep the engine speed up. Diagnosed with VCDS and found that number 4 cylinder was misfiring. First suspicion was that the ignition coil packs may have given up on me after almost 100K km. 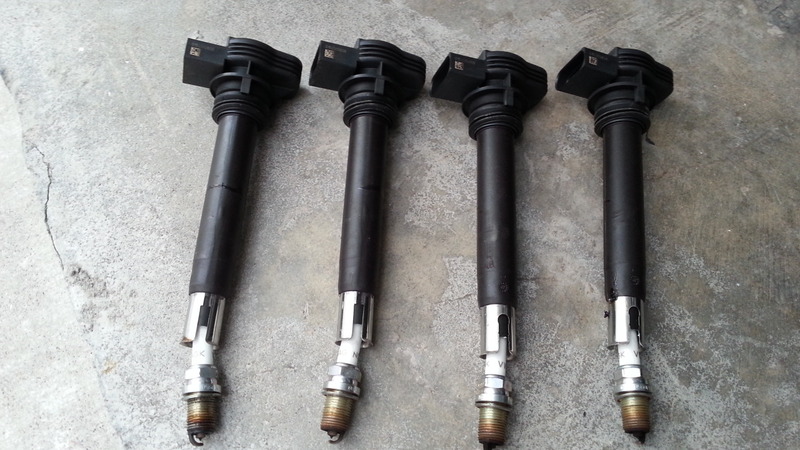 Got a set of 4 ignition coil packs and a set of my favorite Iridium spark plugs from Kian Hua. Total damage ....S$350 ! On the Passat 1.8 TSi engine, removing the engine cover is relatively easy. Unclip the coil packs connectors one by one. Carefully pull out the coil pack and unscrew the spark plugs. 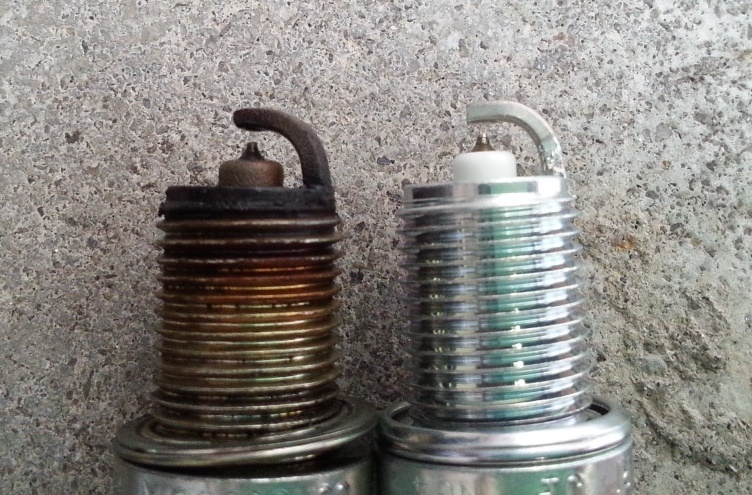 Surprised to see that they were like totally worn and number 4 plug was actually wet with petrol from the misfire. When comparing the new plugs and the old, the gap was much bigger on the latter. The central and ground electrodes were worn down one sided. 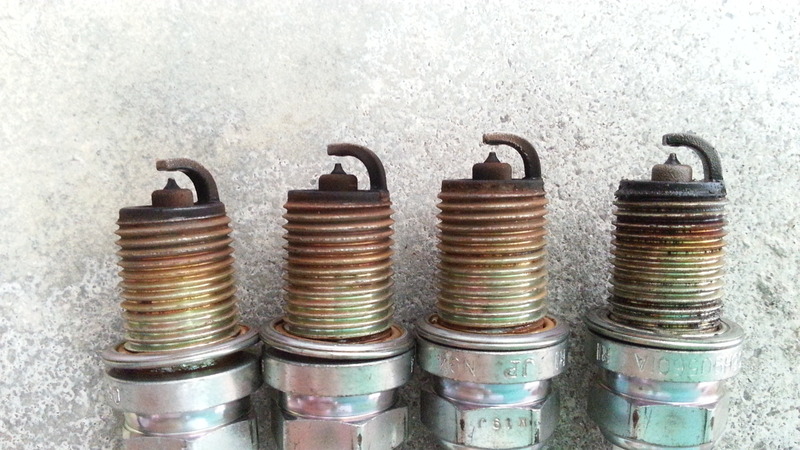 From the look of the plugs, the problem of the misfire should have been caused by the worn plug and not the coil packs. Nevertheless, I decided to use the new coil packs since they have already been purchased. Will keep the old coil packs as spares for long haul trips up Thailand. Conclusion : It would be a good idea to change the spare plugs at 60,000 km intervals.